She completed her post grauation in Obstetrics and Gynecology from Bangalore Medical College, Bangalore India. 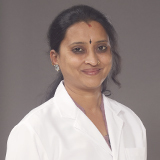 Dr. Srividyahas special interest in the foield of high risk obstetrics, colonoscopy and hysteroscopy. Dr. Srividyais fluent in English, Hindi, Kannada, Tamil, Telugu and Malayalam.